Goats, which offer high quality protein and are low in saturated fats, are now growing in importance in beef-happy North America, Australia, and Europe, as growing interest in ethnic foods, along with concern about cholesterol, gain fans for this slightly tougher but well-flavored alternative. If you’re interested in preparing a goat, here’s my version of a lovely dish I found in many places in Central Mexico. This recipe is an easy introduction to preparing kid, as it does not require specialized equipment. The taste of baby goat is somewhere between lamb and veal, and is perfectly suited to the big, flavorful sauce in this dish. The city of Oaxaca, capital of the state of Oaxaca, lies in a valley known as the Etla Valley. Etla is the Spanish rendering of the Nahuatl word etl, which means “black beans.” So the Etla Valley is the valley of black beans, and this is indeed the bean which one encounters almost exclusively in Mexico’s south. During my first trip to Mexico, as I was interested in both sampling a variety of cuisines and glutting myself on history and culture, I traveled around a fair bit, from Mexico City to Oaxaca and then across the Yucatan, ending my wanderings in Mérida. Great fun. 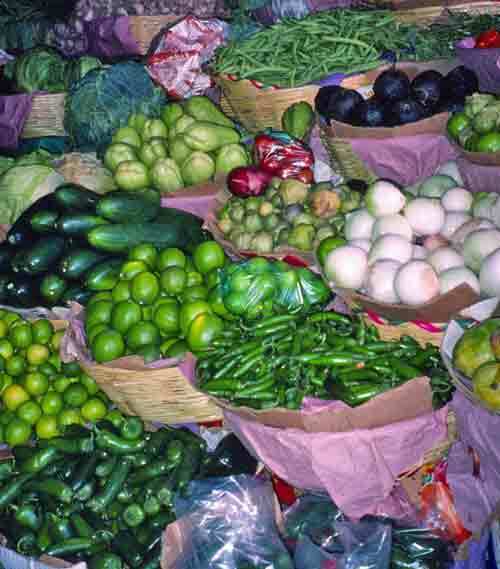 Veggies, fruits, and chiles in a Mexican market. The second time I went to Mexico, it was for cooking school. But my first trip was just to tour, to visit a variety of regions and sample a variety of regional specialties. Mexico is a key location for culinary history research, because so many foods either arose or were further developed here. Mexico and vicinity was home to turkey, maize (probably first developed in the area around Oaxaca), chocolate, vanilla, and squash/pumpkin. The region also acquired, through trade and travel, avocado, tomato, and chilies from South America—and chilies were not merely adopted, but also bred for variety, and Mexico still has more varieties than anywhere else. In addition, there are indigenous foods that have not spread so widely, such as tomatillo, chayote, nopales (cactus pads), and tunas (cactus pears). Combine all those dandy foods with a few introduced items and techniques from Europe, and golly, the food in Mexico is good. And far more varied than most people realize (unless they’re fans of Rick Bayless). Bread seems like a pretty basic food, sort of an irreducible minimum on which one builds. 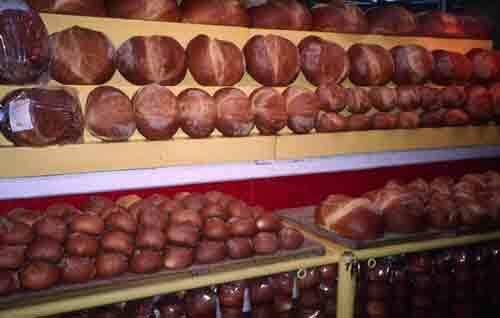 But bread is actually quite complex, and it was not the first thing people did with cereal grains. For a big chunk of early human history, grains were simply parched on hot stones or pounded to a rough powder and boiled into gruel or paste. (In fact, in many regions, these food forms are still important, from the foofoo of West Africa to the tsampa of Tibet.) Scholars believe that the first time people realized they could put the paste on the hot stones, producing a simple flatbread, was likely the late Stone Age. And just as gruel and paste persist to the present day, so do classic, stone-cooked flatbreads, from Mexican tortillas to Scottish oatcakes to Chinese pancakes.